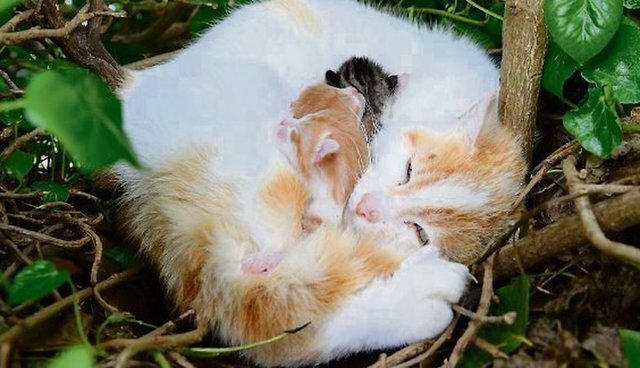 A stray cat in Ireland is raising her newborn kittens in the best home she could find: an empty birds' nest perched about 8 feet off the ground. Homeowners Henry and Fiona McGauley, who also run a pet store together in Ardee, Ireland, made the startling discovery last week. Henry was out in their backyard when he heard noises coming from a nest. Instead of baby birds, he saw a local stray curled up in the nest with her four newborn kittens. The McGauleys are now looking after the little family. 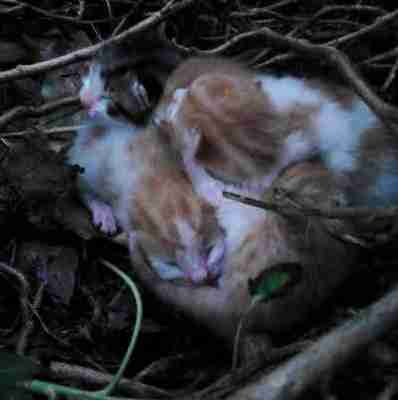 "The nest is some distance off the ground and one of the kittens fell out of it a short time ago," Fiona told the Irish Examiner. "I was able to get it easily and put it back but we will have to put them somewhere safer." Here's hoping the McGauleys can get the mama cat and her little babies into a comfier home soon, preferably one that's on solid ground.